Various Gopher Tortoises of the southern United States are the only true tortoises of North America. They dig long, underground retreats’by shoveling the soil with their forefeet and then pushing the loosened dirt out of the entrance. Burrows have been traced for over 40 feet and with the deepest part 10 feet underground. These tunnels are remarkable structures when one bears in mind that the turtle is only about a foot long. Many other animals share these tunnel systems. The two species of these medium-sized animals feed mainly on plant material. The Western Desert Tortoise subsists mainly on cactus from which it extracts the water, allowing it to inhabit regions where there are few opportunities for drinking. 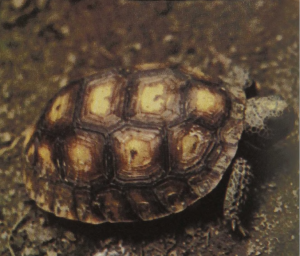 Gopher Tortoises are endangered and are now protected.